What is CloudMoyo Crew Management? 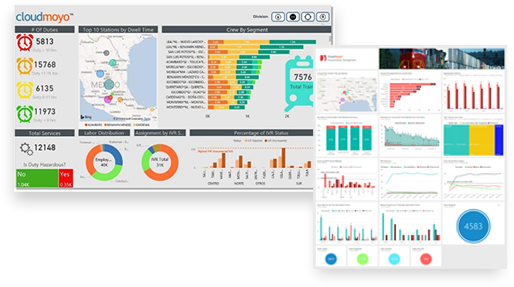 CloudMoyo Crew Management (CCM) is next generation cloud native SaaS product that empowers railroads to manage crew process across boards, optimize crew deployment, track qualifications and compliance, and provide real-time visibility with advanced crew analytics. Formulate optimized crew boards with sophisticated algorithms factoring crew eligibility, certifications, hours of service (HOS), and duty hour compliances, crew penalties, leave records, vacations, and bidding. Assist complex payroll procedures with automated timekeeping calculations, rates of pay, time to gross calculations, arbitraries management, and cost-of living-adjustments (COLA). Seamlessly connect with business systems SAP, ERP, and HRMS. Provide role-based access to labor representatives and compliance officers for pre-congifured reports related to HOS compliance, and crew boards. Read Full Case Study Now! 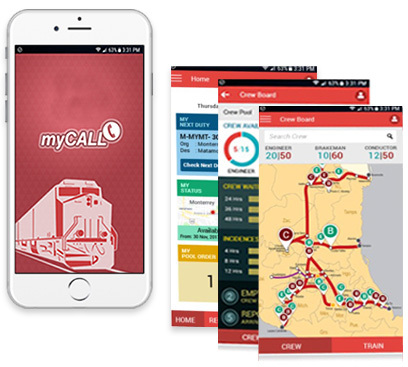 The MyCall application on fosters effective collaboration with the crew by bringing access to day-to-day activities at their fingertips in a user-friendly, intuitive interface.